Posted October 17, 2018 by laurielmorrison & filed under Every Shiny Thing, Middle Grade Literature. Today is Every Shiny Thing’s half-birthday! It’s officially been out in the world for six months, and to celebrate, Cordelia and I wrote a really fun post all about collaboration. We talked to four other co-author pairs—Kristine Asselin and Jen Malone, Saadia Faruqi and Laura Shovan, Brad McLelland and Louis Sylvester, and Olugbemisola Rhuday-Perkovich and Audrey Vernick—and put together this article about how and why each pair collaborated. They all had some great insights about the writing process and smart tips for writers and teachers. 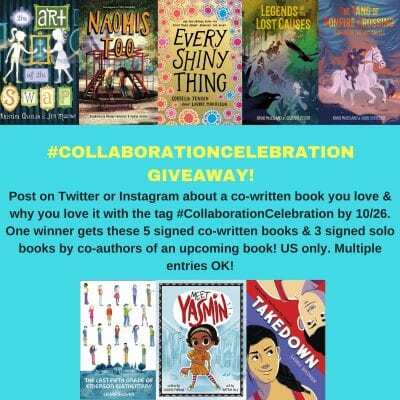 And thanks to their generosity, we’re running a #CollaborationCelebration eight-book giveaway! Check out our post and enter the giveaway if you’d like! And a big THANK YOU to everyone who has supported Every Shiny Thing over the past six months! Wow! What a great giveaway! And thank you for the discussion of the other collaborators. I’m always looking for good books. Thanks, Linda! We loved hearing from the collaborators and learning about how they approached their books. Really interesting and insightful article. I recently joined a “Story Starter” meetup, and I’ve found it fascinating how five people can begin with the same prompt and take it in such diverse creative directions. I imagine co-writing brings the same sort of amazement! Thanks for sharing, Laurie! Thanks, Rebecca! And the “Story Starter” meetup sounds like so much fun! What a great idea.